Calcium Carbonate Limestone (marble) crushing unit is the latest project this year for Faida International Pvt Ltd. And SBM is providing the machines and service for this project. Calcium Carbonate Limestone (marble) crushing unit includes crushers, ball mills and air classifier powder concentrator and other machines. The final products are stone powder with mesh size 400/37 micron, 800/18 micron, 12 micron and 8 micron. And the capacity is about 2 to 4 tons per hour. Preliminary work is mainly designing. According to the characters of local stones (limestone/marble) such as humidity and rigidity, SBM has designed the complete Calcium Carbonate Limestone (marble) crushing production line which satisfy the demand for capacity. 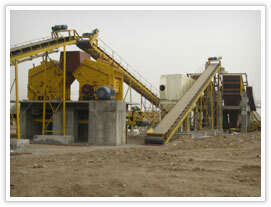 Now the complete crushing unit has been transported to there, and is being installed and debugging.